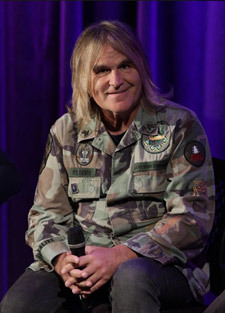 Following a 1500 mile road trip across the American Southwest that included stops at Four Corners National Monument, Monument Valley and The Grand Canyon, Mike Peters and The Alarm arrived in Los Angeles ready for the official Premiere of ‘Man In The Camo Jacket’ at the prestigious Grammy Museum in downtown Los Angeles. It was a special evening with every seat in the house taken and the film shown using the latest 8K laser projection technology. 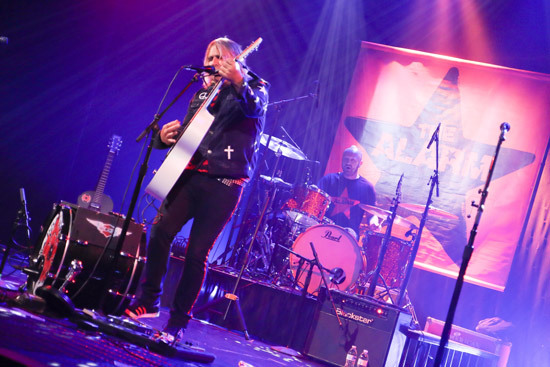 Film director Russ Kendall and producer Jonathan McHugh joined Mike on the stage for a Q&A hosted by Grammy Museum Director – Scott Goldman and afterwards, Mike regaled the audience with some great stories and song performances. 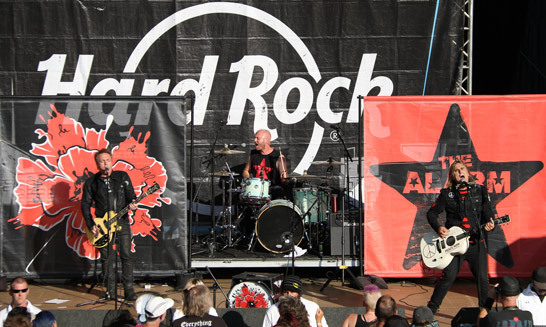 Next day in San Francisco, the band crash-landed back on to the Vans Warped Tour for a rollicking set, powered by drummer, Paul Davis who had also just flown back in from the UK, while Smiley was in Europe for some festival appearances with Archive. The Barb Wire Dolls climbed aboard for a closing ‘Two Rivers’ as the lead singer of GWAR looked on from side stage. 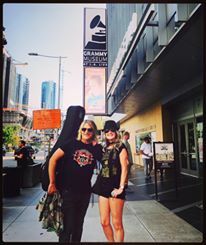 24 hours later the tour found itself in San Diego where Mike Peters was interviewed by long time alternative music radio station 91X before hosting another TEI / Hohner Harmonica workshop. 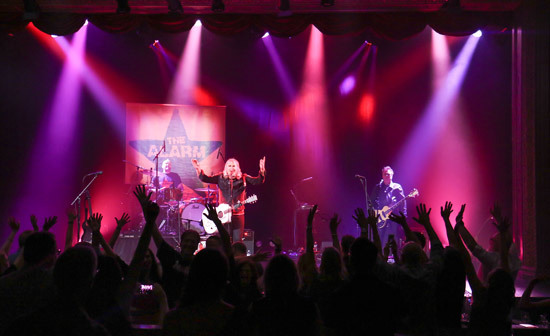 It was another great set of Alarm essentials with members of T.S.O.L. (who once supported The Alarm at Irvine Meadows, CA in the late 1980’s), and The Adolescents looking on (Dan the guitarist of Adolescents had even brought his vinyl copy of ‘Declaration’ to be signed by Mike). 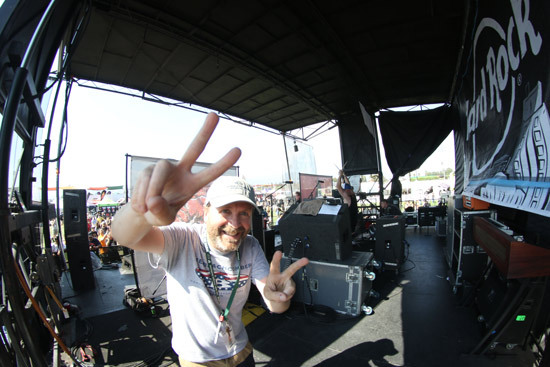 It was a relatively short hop to Pamona for the final stop of the Vans Warped Tour and a large crowd gathered to see the band, including Vans Warped Tour, Producer, Kevin Lyman. 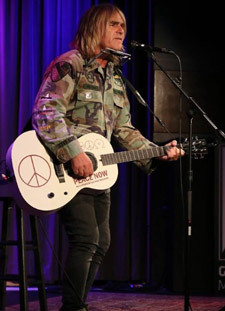 During the set, Mike Peters thanked Kevin for inviting The Alarm on to the tour and described him as a true visionary. 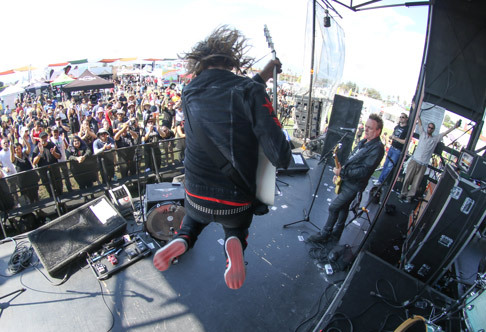 Kevin Lyman is the creator of Vans Warped and played a part in launching the careers of countless US bands. 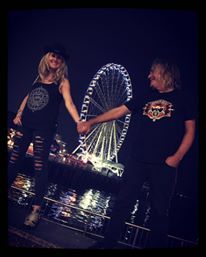 Kevin met Mike in 1986 when he worked on his first ever show in the music business which happened to be a band from Wales called The Alarm!!. Rising to the occasion and as if saving their best until last, the band pulled out all the stops and delivered their finest set of the Vans Warped Tour so far. 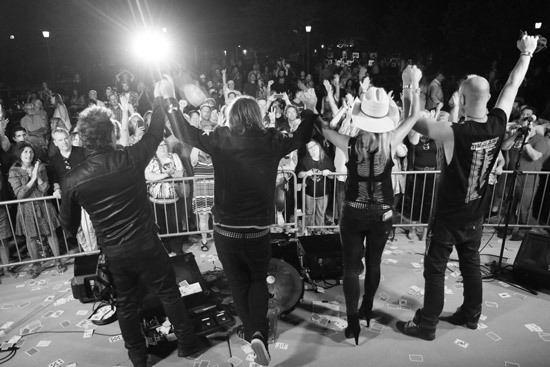 Goodbyes were exchanged with crew and tour staff and the band headed off into the California sunset, bound for the Pacific Northwest and a sell-out show in Seattle at the Triple Door. 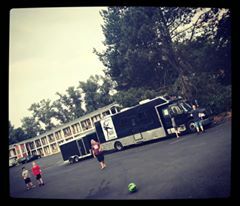 On the way up from California, the ‘Camo Jacket Tour Bus’ pulled into Portland, Oregon where Mike Peters stepped off to perform a ‘live’ session for Kink 101.9 that was broadcast on air over the radio waves and streamed over the internet. Mike was in fine voice and gave his all for the audience. A Bush fire on the Interstate 5 nearly derailed the proceedings but Tour Manager Andy Labrow used his navigational skills to work a way into Seattle itself, just in time for soundcheck. 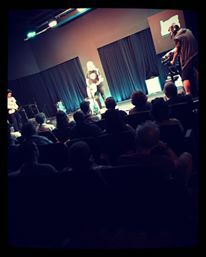 It was a frantic hour getting everything ready for the show. 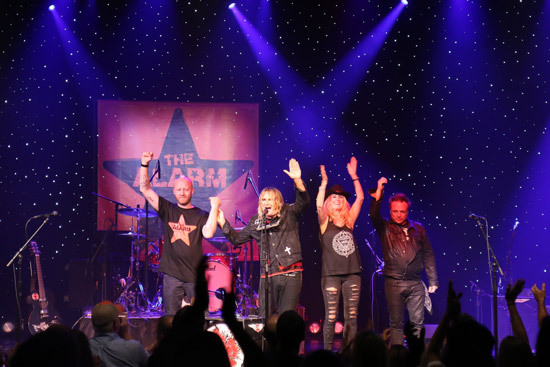 At 7:30 the group hit the stage led by Mike Peters who introduced the set list with ‘Unsafe Building’ before strumming the intro to ‘Declaration’, with the drums of Paul Davis and bass of James Stevenson heralding the start of ‘Marching On’. 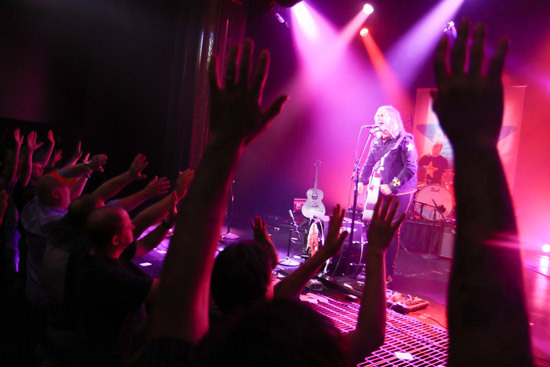 Mike took great joy in recounting the story of how The Alarm’s ‘playing card’ ritual had first come into play during a Top Of The Pops appearance in 1984, and invited audience volunteers onto the stage to throw their cards during the ‘All cards are marked, all fates will collide’ trigger point. 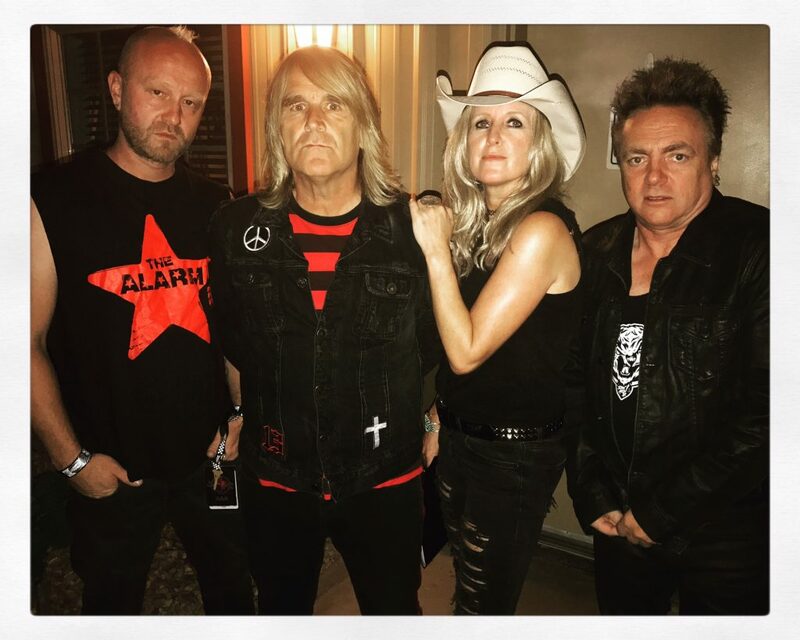 An impromptu ‘Anarchy In The UK’ was fired off to highlight the impact the original ‘Spirit of ’76’ UK punk rock era played in allowing The Alarm to become the group it has been and still is, as it blasted out an urgent performance of the classic Alarm anthem. An emotional and acoustic ‘Walk Forever’ was met with a superb rendition of ‘Ran In The Summertime’, with drummer Paul Davis complimenting the James Stevenson guitar counterpoint superbly. 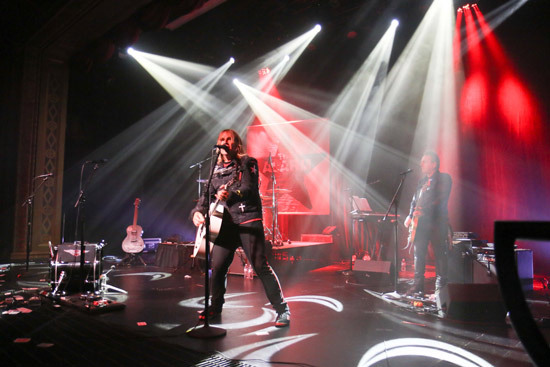 The crystal clear vocals of Mike Peters were drenched in delay against layers of lush strings conjured up by Jules Jones Peters from her effective Korg keyboard station. 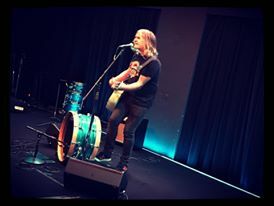 The connection with the audience was by now immense and the temperature was ramped up by the introduction of live favourite ‘Rescue Me’ followed by the proto-blues of ‘Sold Me Down The River’. Even the oft-neglected ‘Raw’ album was represented with a powerful ‘Rockin’ In The Freeworld’ which was punctuated by a pre-song story from Mike about how the band played ‘Freeworld’ in Seattle for the very first time (even before writer Neil Young! ), back in 1989. 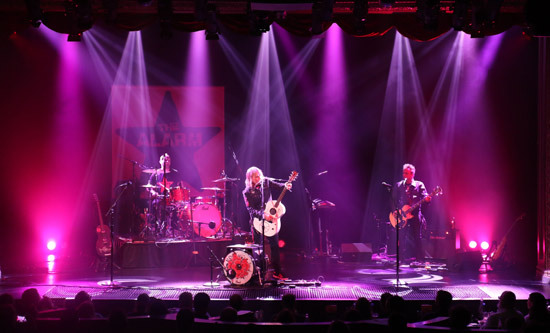 The story of The Alarm was brought up to date with the introduction of ’45 RPM’ and Mike asking for hands of 4 fingers and 5 – a request that was duly obliged by all. 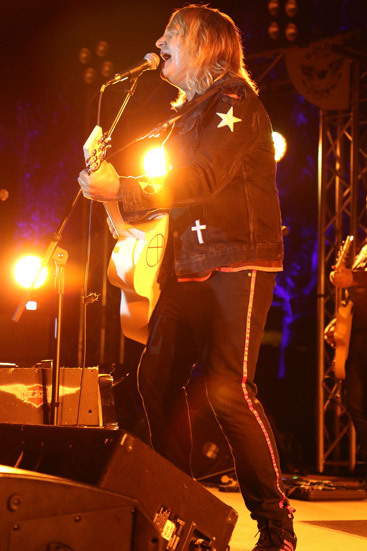 The set closed out with an original ‘Declaration’ style version of ‘Sixty Eight Guns’ which featured great interplay between the band and audience as the strobe lights flickered and flashed. 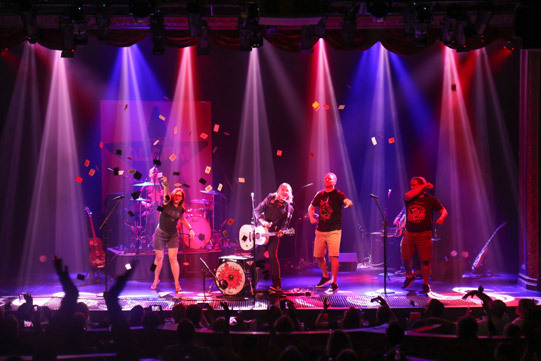 ‘Blaze Of Glory’ and ‘Strength’ were encored, and an hour later the band was back on stage to perform again for another audience. This time the set began with ‘Shout To The Devil’ and a one, two punch of ‘Marching On’ that segued into the middle section and chorus of ‘Where Were You Hiding?’ as performed on the Vans Warped Tour. It was clear that everything was going to be different, even the end of ‘Hiding’ was punctuated with the opening fanfare from ‘Sixty Eight Guns’, only for the band to play the more modern version that slow builds through the double verse into the first chorus. ‘The Deceiver’ got an outing that was followed by a purely acoustic one man band version of ‘The Stand’ with Mike stopping half way through to tell the tale of Joe Strummer of The Clash (and Joe’s confession to long time Alarm fan Graham Lampen), that he was indeed a ‘secret Alarm admirer’. It was engaging stuff. ‘Rain In The Summetime’ and ‘Sold Me Down The River’ were carried over from the first set, but then Mike broke into a spontaneous ‘Moments In Time’ that stopped at the line “I remember it now like it was yesterday, playing this guitars at a frantic pace”, before opening up the electric channel on his Auden six string and letting loose a powerhouse trio of modern Alarm classics – ’45 RPM’, ‘Superchannel’ and ‘Without A Fight’. 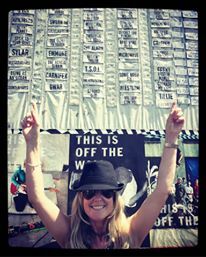 It was back to where it all started for set finisher ‘Spirit Of ’76’. The band came out for an encore of ‘Blaze Of Glory’, ‘Strength’ tempered with a glimpse of the future by finishing up with ‘Two Rivers’. 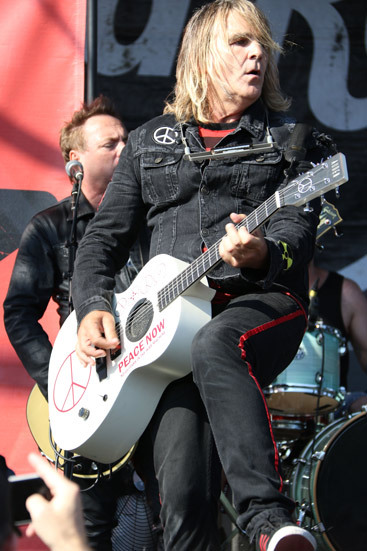 Mike Peters, James Stevenson, Paul Davis and Jules Jones Peters did The Alarm and the two audiences proud in Seattle. 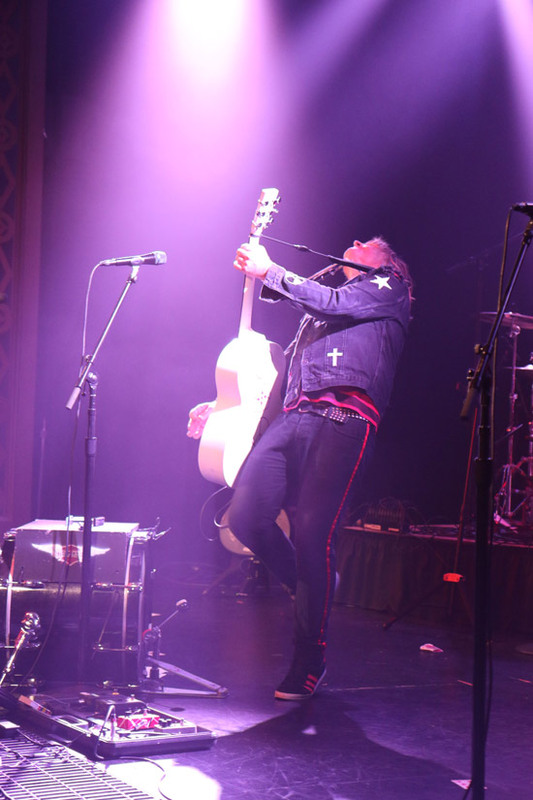 Delivering two sets of high intensity and passion, both performed with grace, emotion, good humour and diverse set lists that honoured both the past and the future, allowing the quality of the musicianship and songwriting to come to the fore. 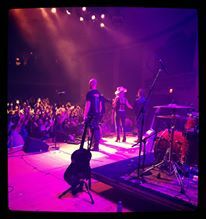 At the Aladdin Theatre in Portland, Oregon, a large crowd gathered in the seated auditorium but as soon as the band came on to the stage they were all on their feet. 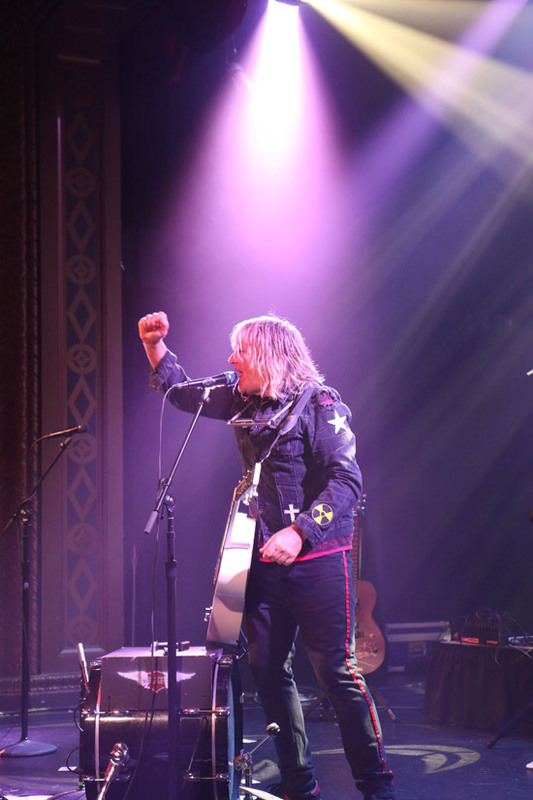 The atmosphere was electric right from the start as Mike Peters wasted no time between songs in the opening minutes, ripping through ‘Unsafe’, ‘Marching’, ‘Hiding’ and ‘Absolute Reality’ in quick succession. It was a thrilling opening and when Mike introduced ‘Spirit Of ’76’ it was game over. The story of survival that is at the heart of the ‘Man In The Camo Jacket’ film was revealed in the music of the band here in Portland, with much emphasis placed on the post ‘In The Poppy Fields’ re-birthing process through ‘Under Attack’ and into the musical focus of ‘Blood Red / Viral Black’. Hearing the set finishing with ‘Two Rivers’ was just as uplifting as listening to ‘Unsafe Building’ and for new fans arriving into the shows today (of which there are many), it must be difficult to differentiate between songs that echo from the past and those which point to the future. 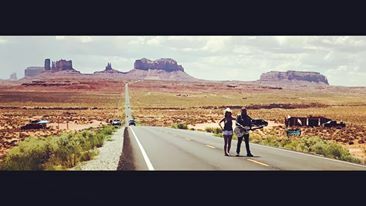 “A thousand miles before us” and a day to get there! 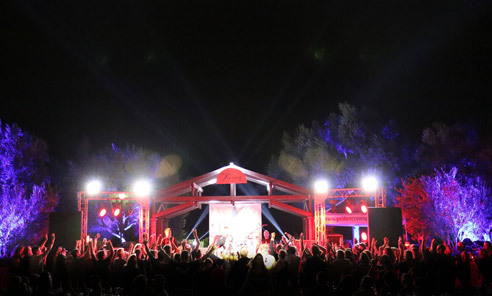 Temecula, CA beckons and an outdoor festival-style appearance to look forward to. 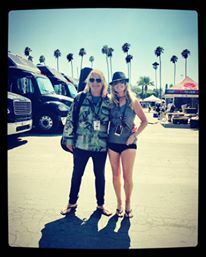 Temecula is in the heart of California Wine Country and the heat was pounding down onto the scorched earth as the band sound-checked but as soon as the sun set, a cooler air greeted the arrival of the band to the stage for the main set. What a night it turned out to be with the band adapting to the surroundings right from the start and everyone pushed up against the barrier trying to get closer and closer to the action and energy being generated. 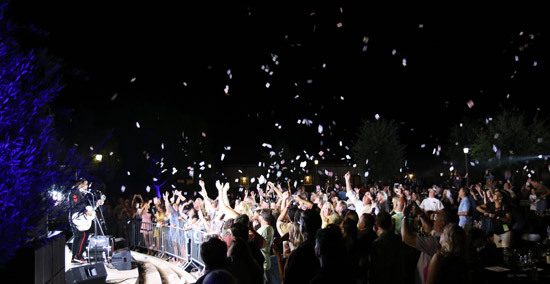 During ‘Walk Forever’, Mike encouraged everyone to take out their mobile phones and ‘Light up the sky’, it was a beautiful sight, reminiscent of concerts back in the seventies, when people would hold lighters in the air. The concert built up to a fanatical climax when Mike introduced ‘Where Were You Hiding?’, telling a tale about a fan named Matt Cappaluto who was attempting to organise the world’s largest playing card shower during the song. 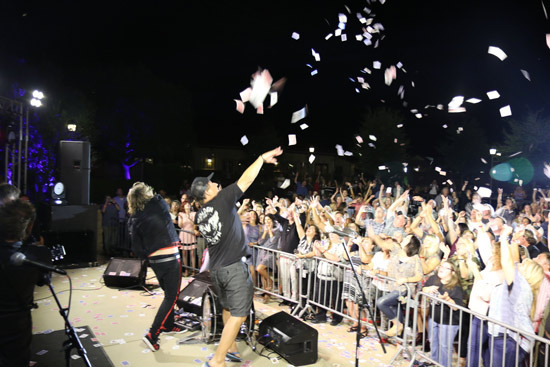 As soon as Mike counted off the intro, playing cards filled the skies and there was virtually no let-up during the entire song performance which also saw Mike bring Golden Crown Concert Promoters Don and Greg Hassler up on the stage to join in. I’ve never seen so many cards on the floor after an Alarm concert as Matt and his friends organised their own clean up crew and quite possibly laying down a challenge that other fans in other cities may well follow in the future. 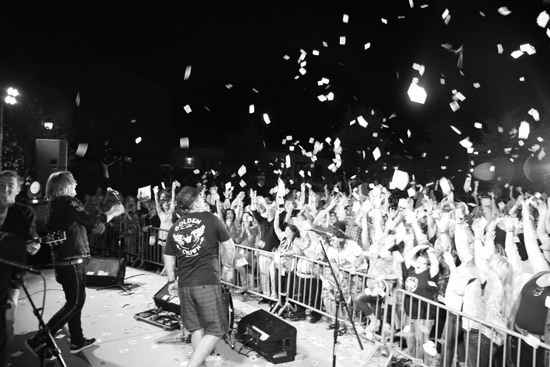 10,000 cards were thrown!! Beat that! 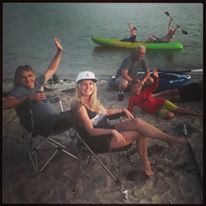 Mike, Jules, Paul and James all spent considerable time after the show chatting to fans both old and new while Love Hope Strength was on hand to swab people to the donor list, quite literally “saving lives one concert at a time”. 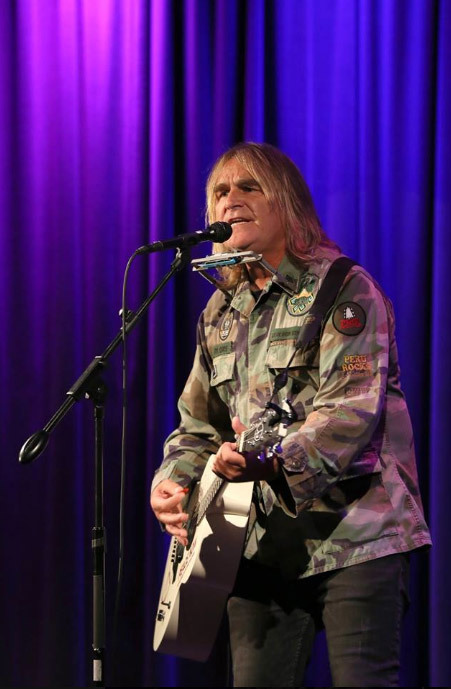 Win A Mike Peters Signed Harmonica as Season 2 Of The Alarm Podcast Launches!